I always thought it would be nice to have a Christmas No 1 – if nobody remembers you for the rest of the year, they’ll remember you at Christmas. Bob Heatlie wrote the song especially for me and I thought it had all the ingredients for a Christmas single: festive lyrics, bells, the lot. I listened to it and I could picture snow. Bob had made a really good demo, so [producer] Dave Edmunds and I basically just copied it, with a rockabilly beat, nice harmonies and imagery that families can relate to. In those days, pop on TV was mostly kids’ programmes and Top of the Pops, so we made a video at Santaworld in Sweden. The young girl starring in it had won a competition to go to Lapland. My son was one of the kids in the log cabin full of toys. Making it was such fun. The Santa was an actor – you’d see him in the canteen having a cigarette and a sherry and he couldn’t get his ’tache off. Because it wasn’t snowing, we had to hire snow machines. It was the same when I did the video for It’s Raining: we used rain machines and I ended up absolutely soaked. 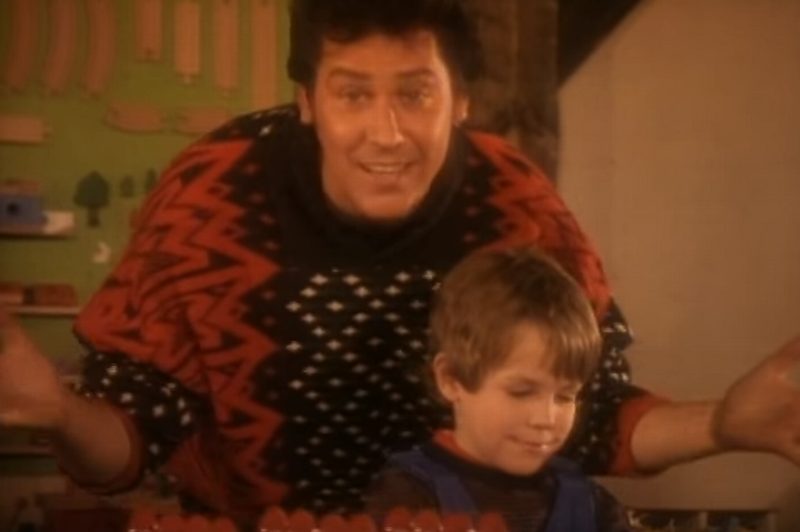 People always remind me of the embarrassing Christmas jumper in the video, but I didn’t have stylists, I just threw something on. The snowball fight was scripted, though. Duran Duran watched it on Saturday SuperstoreVideo Vote and said: “Oh look, he’s fallen over. Har har har!” Little did they know I did it on purpose, so it would look real. I thought the song deserved to be No 1 and didn’t want it to be a No 2, but in 1984, Band Aid released Do They Know It’s Christmas? There was no way we could compete with such a high-profile charity single, so we held our song back for a year. The Radio 1 “sleighlist” – the Christmas playlist – only lasted three weeks then, so you didn’t have long to get to No 1. Merry Christmas Everyone went from 38 to 10, then 2, and then it hit the top spot, by which time the rereleased Band Aid single was at No 3. I’m thrilled that people still play our song every year. It’s nice to be part of Christmas. I worked in a studio in Edinburgh and a Scottish classical singer called Mary Sandeman kept saying to me: “Bobby, I’d love to have a bash at the charts. Could you come up with a song for me?” I avoided her for so long she phoned me to say she couldn’t wait any longer and had booked the studio. I bashed off a song called Japanese Boy the night before recording, then realised it was actually pretty catchy. It was rejected by all the labels. Even my own publisher hated it. Then Hansa put it out, with Mary using the more oriental-sounding name, Aneka. When it became an international No 1, it gave me the funds to build a studio in my garage and continue writing songs. When it first became a hit, I was walking through a shopping mall in Edinburgh and these two girls were arm in arm, with Christmas hats on, singing it at the top of their voices. I thought: “Wow!” It was almost better than seeing Shaky doing it on TV. It still goes in the charts every year after all this time and it always cheers me up if I’m out somewhere and hear it playing. And I get a Christmas card from Shaky every year. • Shakin’ Stevens’ Greatest Hits and More tour starts on 1 March in Salisbury City Hall.